is a small two-headed drum, used in Hinduism and Tibetan Buddhism. The skull (thöpa) damaru is made from a male and female skull bone or calvarium, cut well above the area of the ear, and joined at their apex. Damru is one of the attributes of several deities and gods (of Hindus), particularly of Shiva. Damru is a small hourglass shaped drum, and is particularly associated with Shiva in his aspect as the Nataraja, performing the cosmic dance of tandava. The sound of damru represents the primeval sound and the rhythm from which, according to cosmology, the universe emerges and in which it dissolves into, before re-emerging again. 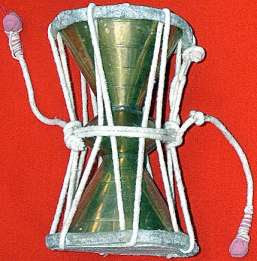 Indian Musical Instrument Damaru is the most common hour-glass drum in India. There are two drumheads on each side of the resonator which are laced together with cord. Near the centre of the lacing are two loose knoted cords. The knots on each end strike both heads to produce a rattling sound. This is affected by rotating the drum rapidly in alternating directions. 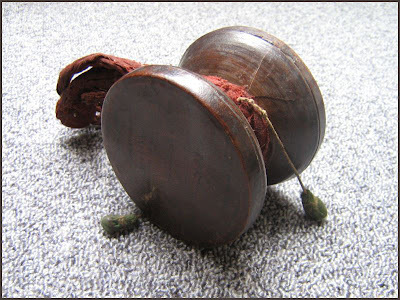 The pitch is bent by squeezing the lacing.The damaru has very strong cultural associations. It is strongly associated with the God Shiva and sadhus ( Hindu religious men). The Resonator is Made of brass and the height of Damru is around 6"
The weight of damru varies from 250-330 gms.
. Denden daiko でんでん太鼓 twist drum .
. Ritual Drums of Japan .
. maizaru 舞猿 dancing monkeys .